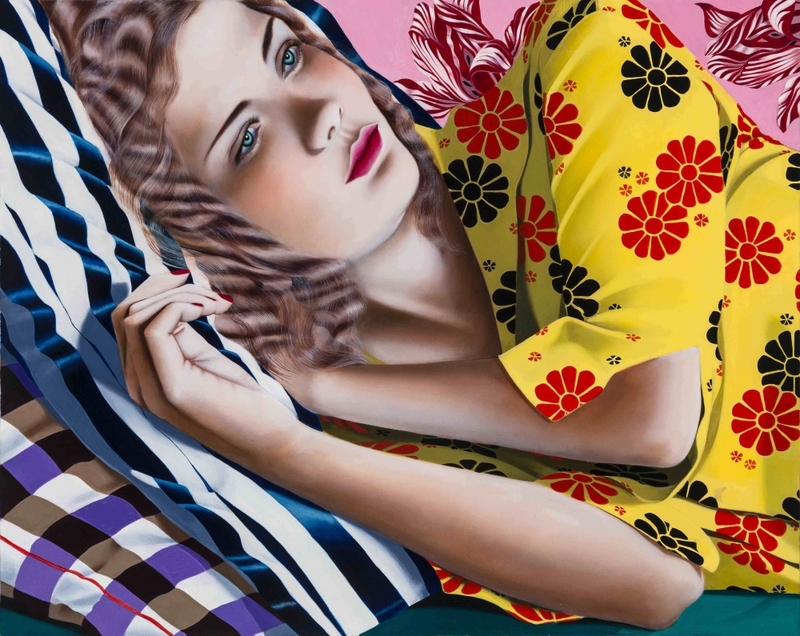 We are moving out of a phase in painting heralded as the “return of the figure,” but before we do, you might stop into Fredericks & Freiser to see Jocelyn Hobbie’s new canvases. Ms. Hobbie’s approach to figurative painting is to juxtapose the illusionistic faces, necks and hands of young women with flawless features and skin — reminiscent of heavily airbrushed or Photoshopped magazine ads and layouts, or the Facetune app in which you can retouch and sanitize your selfies — with the painter’s bright, flat patterns. Ms. Hobbie’s paintings might be compared with Kehinde Wiley’s, which use a similar figure-plus-pattern formula, as well as the languid society portraits of John Singer Sargent or Jean-Auguste-Dominique Ingres. The juxtaposition of patterns also recalls the asymmetrical textiles in African photography and something closer to home: the bonneted girl in clashing calico who became a ’70s phenomenon and was named after Ms. Hobbie’s mother, the author and illustrator Holly Hobbie. Jocelyn Hobbie has illustrated children’s books (written by her brother, Nathaniel), but here she shows a sophisticated understanding of painting, borrowing tricks used by Ingres and visible in his portrait of the Comtesse d’Haussonville (1845) in the Frick Collection. In that perfect-seeming painting, a young, beautiful woman leans against an upholstered fireplace. Look closer, however, and you see that her right arm juts out of her stomach at an impossible angle. Ms. Hobbie includes similar high jinks: hands that don’t match up with bodies; necks that don’t quite fit torsos. Here she reminds us that all painting is essentially a form of abstraction, fantasy and visual seduction.